A group of Senate Democrats pulled an all-nighter last night, talking about global warming. As always, however, they displayed ambivalence toward the issue: none of the vulnerable Democrats who are up for re-election in the fall (Landrieu, Begich, Pryor, Hagan, Walsh) participated. Also, if you seriously want to call attention to an issue, the middle of the night is not necessarily the best time to do it. But this is the strangest thing about the Democrats’ all-night talk-fest: it took place in the Senate. The Democrats control the Senate. So will Senate Democrats be introducing legislation to address the supposedly world-threatening issue of global warming? No, actually. They don’t intend to do anything at all. The Democrats no doubt remember their own experience with cap and trade in 2010, and also are aware of what happened to Australia’s Labor Party after it imposed a carbon trading scheme. So it is easy to understand why they don’t plan to introduce legislation that likely would be suicidal. But that being the case, why did they bother to engage in the talk-a-thon, which can only make them look silly? The answer, I think, has to do with campaign cash. Tom Steyer, a billionaire who has made a great deal of money on government-subsidized “green” energy projects, has become one of the Democratic Party’s most important donors. On February 18, he hosted a fundraiser at his home that netted $400,000. Harry Reid and six other Senators attended, along with Al Gore and a number of rich environmentalists. At that meeting, plans for last night’s talk-a-thon were already being laid. Steyer’s advocacy group, NextGen Political Action, plans to spend at least $50 million of the former hedge-fund manager’s money, plus another $50 million raised from other donors. The group will refuse to spend money on behalf of Democrats who oppose climate regulation, but will not spend money against them either, according to Chris Lehane, a Steyer consultant. So the Democrats are trying to walk a narrow line. 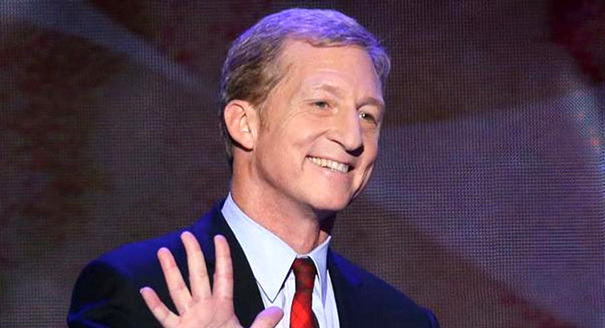 They need to make noise about global warming to keep the cash flowing from Tom Steyer and other deep-pocketed environmental activists (some of whom, of course, are also “green” energy cronies). At the same time, they can’t actually do what the activists want, like cap carbon emissions, lest they be voted out of office. Hence last night’s all-talk, no-action event. PAUL ADDS: I think John’s explanation is correct. But I also believe that the all-nighter isn’t solely for the benefit of big-money contributors. Some Democrats will be running this year on the global warning issue. In the special election in Florida’s 13th District, for example, Democrat Alex Sink has campaigned hard on the issue. This has helped her, at least if one believes the results of PPP polling. So even though the Dems don’t seem prepared to do the legislative bidding of deep-pocketed activists, it might make sense to set the table for candidates who want to flog the issue in their district.